I moved from a populated area in Northern VA to a much less populated area in western North Carolina. There are perks living in a smaller area, but the biggest thing I miss about NOVA are the options that I had for food purchases. Wegmans, Whole Foods and Trader Joes were three of the best grocery stores within five miles of my house. Yes, I had to sit in traffic to get there on most days, but they were always worth it. Now, the food stores I have available are good - OK I weep internally when I walk in, but they have all the necessities. The one positive is that three times weekly from March through November my new hometown has a farmers market. Its wonderful! I get fresh produce, baked goods, meats, and local homemade goodies for way less than I ever spent in my fancy food stores in NOVA. The other day I was walking around the farmer’s market buying goodies for the week and I spied some fresh HUGE blackberries and delicious juicy looking peaches. I also scored a huge bunch of basil for a whopping $2, that was unheard of where we just moved from. I decided I was going to use these goods to top some fresh homemade biscuits. I let the fresh fruit macerate in the liquid for a few hours and then topped them on my homemade biscuits, letting the liquid soak into the dough. Whipped cream is an option and I really wanted some fresh whipped cream that day. Bring the sugar, water, wine, and vanilla bean to a boil on the stove top in a saucepan. Stir on medium-high until the sugar is dissolved and then remove from heat. Stir in the basil and lemon juice. Let it sit until it cools down then strain into the container for the fruit. Add in the fresh blackberries and sliced peaches. Cover and refrigerate for 3 hours and up to 3 days if you want. Serve over fresh biscuits, pound cake, ice cream, or just with fresh whipped cream. 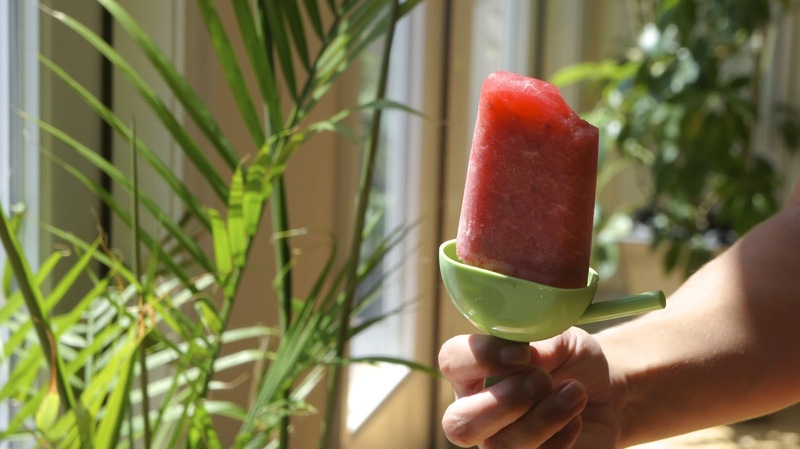 I had some fruit and basil juices left over the next day so I blended them and made them into ice pops. Sooooooo refreshing and delicious! Labels: Dessert., Farmers Market., Food.